JIMMY CHOUX (NZ) (Bay 2007-Stud 2012). 12 wins-3 at 2, New Zealand Derby, Gr.1. Leading NZ First Season Sire 2015-16. Sire of 96 rnrs, 42 wnrs, inc. SW Manolo Blahniq (ARC Eclipse S., Gr.3), Bostonian, SP Jimmy Lincoln - Great Profit (H.K. ), The Great Southern, What Choux Want, Secret Ambition, Cobblertothestars and of Addison, Batabullet, Chambon, Chaussure, Hoofaloof, Poker Face, Sweet Varden, Midnight Runner, Ballet Choux, Jackson Road, etc. SAY NO MORE, by Pentire. 6 wins from 1150m to 1600m, NZ$303,675, A$7,750, WRC Thorndon Mile, Gr.1, Te Aroha JC New Zealand Thoroughbred Breeders' S., Gr.1, ARC New Zealand Herald H., Hawkes Bay Be Sunsmart Today H., Marton JC Jim Skou Memorial H., 2d BOP RC Gilmours Tauranga H., WRC Stella Artois H. Half-sister to Lucy Love. This is her third foal. Her second foal is a 2YO. Her first foal is unraced. SAY NO MORE (Pentire). 6 wins. See above. Lucy Love (Four Seasons). 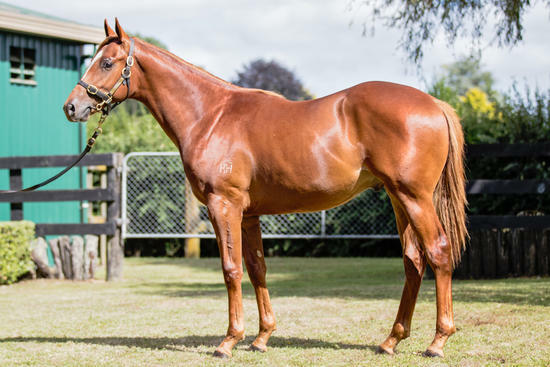 3 wins at 1200m, 1400m, ARC Body Bronze 3YO H., Taranaki RC Budget Rentals New Plymouth H., 2d Cambridge Breeders' S., Gr.3, Waikato RC Skycity Hamilton H., 3d Hawkes Bay Chianti H., 4th BOP RC Tauranga Classic, L.
Nudge. 5 wins-1 at 2-to 1400m, Counties RC Cross Bar H., Waikato RC Royal & Sunalliance Insurance H., 3d Avondale JC Portage Peninsula Hotel 3YO S., ARC Speights Pride of the South H., Sunday Star-Times H.
Pentour. 4 wins from 1400m to 2100m, ARC Don Ha Real Estate H., Cambridge JC Monovale Sand H., 3d ARC The Oaks Stud H., CM Jillings Cup, Avondale JC PGG Wrightson H., Waikato RC Dunstan Feeds Championship Qualifier. Our Woody. 4 wins to 1200m, 3d STC Aidan's Freeway Hotel H., Parramatta Leagues Club H.
Reigns and Poors. 2 wins at 1600m, 2000m in NZ. Jazzbo Marks. 4 wins to 1350m, BRC Mater Dei School H., Goa Get Noticed H.
Appoint Percy. 3 wins from 1200m to 1600m, ATC TAB Highway P., 2d ATC TAB Rewards H., 3d ATC Tab.com.au H.
Johnny d'Cash. 3 wins at 1200m, 1400m, Marton JC Manawatu Toyota H., 2d BOP RC Wealleans Petroleum H.
Tacash. Winner at 1000m, 3d WATC Yellowglen Colours H.
Averted. 13 wins from 1200m to 2050m in Aust. Sire. Mamoon. 4 wins-1 at 2-from 1000m to 2100m in Aust. Primrose Walk. 4 wins-3 at 2-to 1500m in Aust. Producer. Our Lucy. 3 wins. See above. Pretty Primrose. 2 wins at 1200m, 1400m in Aust. Courage Plus. 5 wins from 1600m to 2200m in Aust. Marsbridge. 4 wins at 1m, 9½f in NZ. Alcidum. 2 wins at 2000m, 3550m in Aust. (SIR) TRUTONE (Fair's Fair). 15 wins from 1200m to 2400m, TRC Hobart Cup, Gr.3, Avondale JC CB Clarke Memorial H., L, Taumarunui Gold Cup, ARC Remuera H., Dominion H., Avondale JC Hurricane H., BOP RC City H., Matamata RC Burwood H.-twice, VATC Inkerman H., ARC Nelson H., 2d Bendigo Cup, L.
KAHOOLAWE (Waikiki Star). 12 wins from 1600m to 2400m, A$172,890, STC Lord Mayor's Cup, L, AJC RAAF H., STC Penrith H., 2d STC Londonderry H., 3d Lismore Quality Cup, BTC Carlton Draught H., QTC Strathpine Cottage Furniture H., STC Mortdale H.
STARRY EYES (Waikiki Star). 3 wins from 1000m to 1600m, Ashburton RC Inglewood S., L. Producer.